Portable, accurate, and easy to use, the Tor Rey QC-5/10 10 lb. 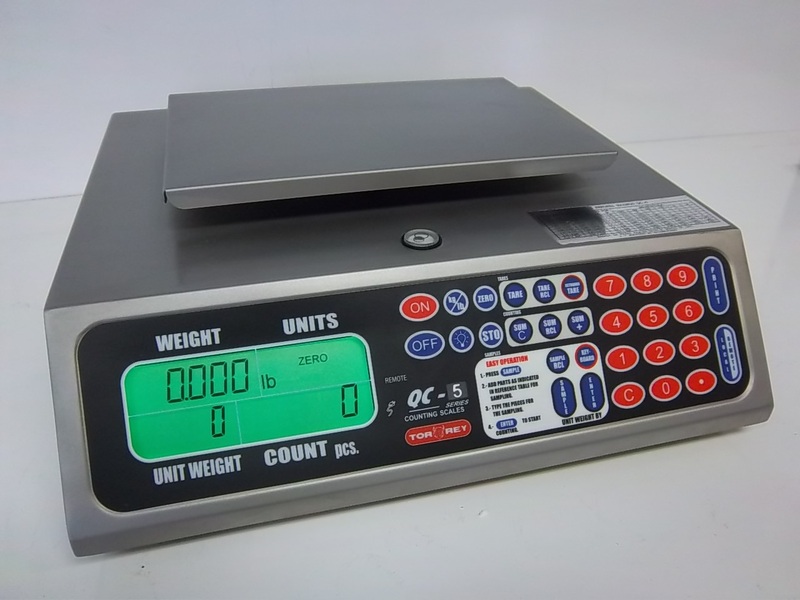 table top counting scale is the practical solution to your weighing needs in warehouse, hardware store, or small business! This table top counting scale can be easily calibrated so you can quickly and consistently package the same amount of a product one after the other. And thanks to its rechargeable 200-hour battery, you can be sure that this unit will stay powered for days at a time, even without a nearby outlet. Made of stainless steel for easy cleaning and long-lasting durability, this rechargeable portion scale features a large 9" x 6" platform and programmable tare function designed to give you total control over all of your measurement needs up to 5 lb. The back-lit, alphanumeric LCD screen clearly shows the weight of portioned items, even in dark areas. To promote accurate and consistent record keeping, this scale can easily hook up to a Windows PC or printer with its RS-232 data port. Dimensions: Width: 15 1/8", Depth: 12 3/8", Height: 5 5/8"
Platform Dimensions: 9" x 6"